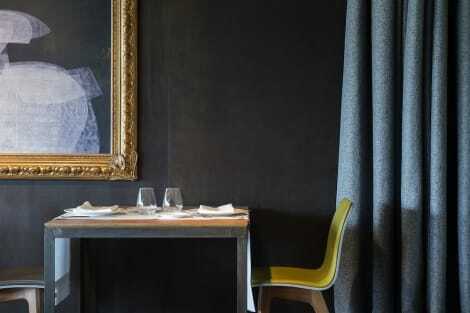 Satisfy your appetite with international cuisine at Bayona, a restaurant which features a bar. Dining is also available at the coffee shop/café. Buffet breakfasts are available daily from 5 AM to 10:30 AM for a fee. With a stay at Hotel Tres Reyes, you'll be centrally located in Pamplona, steps from Parroquia San Lorenzo and within a 5-minute walk of Palacio de Congresos and Auditorium of Navarra. This 4-star hotel is 0.3 mi (0.4 km) from Iglesia de San Nicolas and 0.6 mi (1 km) from Parque de la Taconera. With a stay at AlmaPamplona - Muga de Beloso, you'll be centrally located in Pamplona, within a 10-minute drive of Plaza del Castillo and Plaza Principe de Viana. This 4-star hotel is 2.3 mi (3.7 km) from Monumento al Encierro and 2.4 mi (3.9 km) from Plaza de Toros de Pamplona. The Pamplona hostel is a modern accommodation built and opened in June 2015. Hostel Pamplona has 14 modern and spacious rooms whose decorative theme is inspired by the festivities of the city and internationally known, the San Fermines festivals. We offer an innovative service of reception 100 automated and with total discretion. Hostel Pamplona has its rooms with the most modern facilities: Parking, free Wifi, reception 24-hour automatic, flat panel televisions, Vending machines, air conditioning, heating and private Parking. Its strategic location next to the round North of Pamplona provides an unbeatable access to the hostel for the main industrial areas of the city. With a stay at Mesón del Barro, you'll be centrally located in Pamplona, within a 15-minute drive of Plaza del Castillo and Pamplona Planetarium. This hotel is 0.7 mi (1.1 km) from Yamaguchi Park and 1.5 mi (2.3 km) from Ciudadela. Sleep in the modern Holiday Inn Express Pamplona hotel, strategically located in the south entrance of Pamplona, and just 8 minutes away of the city center. . 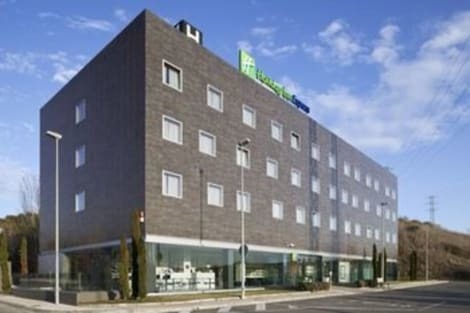 The Holiday Inn Express Pamplona is located in the commercial area of La Morea , the most important commercial area of Navarre, with lots of shops and restaurants, there’s also a cinema, spa, gym and bowling center, etc. Only 2km away of the Navarra Arena and Sadar Stadium, and 3km away of Pamplona’s Airport. Free private parking is available for our customers, inside and outside the hotel. You can also enjoy our free high speed Wi-Fi in every part of the hotel and rest in our rooms with air conditioner and enjoy our free breakfast. University of Navarra and Public University of Navarra are located at just 5 minutes from the hotel. Our location will also allow you to easily move around to visit different areas of Navarra such as Olite and its castle, the Camino de Santiago, enjoy a walk inside the Forest of the Selva de Irati or look for a witch inside the Zugarramurdi Caves; With the possibility of visiting San Sebastian or cross the border to visit some really beautiful French villages such as Saint Jean Pie de Port or Biarritz. The lobby area is medium in size and nicely decorated. Even if you're not familiar with the name you'll have seen footage or heard about the festival of San Fermín which takes over the city for a few days in July. For eight days, herds of bulls clatter along the cobbled streets. There's much more to Pamplona than rampaging bovines, however, and when you book a Pamplona hotel with us you'll discover everything this fiercely proud Basque city has to offer. Known by the Basques as Iruña, Pamplona began as a secure fortress town that defended this part of Spain from invaders. With its huge citadel, appealing parks and beguiling churches, Pamplona offers much. The Plaza del Castillo (Castle Square), which is the centre of the historic Old Town, is where you'll find chic cafés and a melange of buildings whose architectural styles straddle centuries. And from here, the twisting lanes make for interesting diversions along which could well find an interesting bar or a quirky old shop. The Old Town is encircled by walls and ramparts which provide a wonderful way to get around Pamplona and take in the sights, and enjoy the nearby gardens and parks. There are patches of green all over the city. From the wide paths and sculptures of Taconera Park, to Yamaguchi Park with its Japanese garden, there's plenty of places in which to sit and relax or take a stroll. A very visible indication of Pamplona's strategic past is La Ciudadela (The Citadel) which is a well-preserved fortress around which you can walk and enjoy great views of the city and the mountains in the distance. The Neoclassical façade of Pamplona Cathedral disguises a magnificent Gothic church wherein you'll find a stunning 13th-century cloister constructed with gorgeous stonework. Pamplona has its fair share of cafés, restaurants and bars where you can stop for a quick drink or stay longer for a meal and enjoy a refreshing glass of wine or two. The cuisine is varied but with a heavy emphasis on Basque dishes. You'll find all sorts of places to eat, from bakeries to a Michelin-starred restaurant serving Spanish, Italian, fusion and vegetarian. And there's nothing better than a delicious ice cream made in one of the city's parlours. There are three municipal markets in the city. Santo Domingo Market, Ensanche Market, Ermitagaña Market have, between them, over 100 stalls selling high-quality fruit, vegeSEOSITE_LEVEL_DESCRIPTION and meat among other things. The historic quarter contains a number of independent shops but you'll find most stores on the Mayor, Estafeta, Comedias and Zapateria streets. Most things that you'll need are obtainable in a city which has about 500 shops in total.